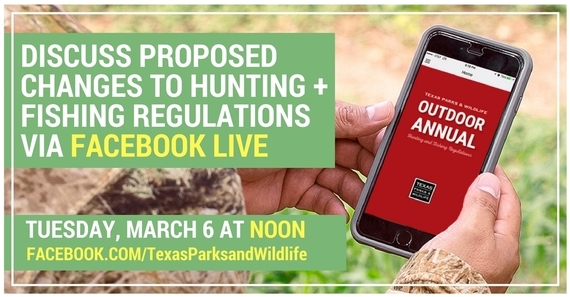 The Texas Parks and Wildlife Department is now accepting public comment on a suite of proposed changes to this year’s hunting regulations, which include: a unified statewide deer season opener, legalizing air guns and air bows for hunting certain wildlife species, and a reduction of the spring Eastern turkey season. Standardize the general deer hunting season statewide to open the first Saturday in November and end on the third Sunday in January. Additionally, staff propose to open the special late season, muzzleloader season, and the late youth season on the first Monday following the third Sunday in January for 14 consecutive days. This proposal would also adjust concurrent turkey hunting seasons with the general deer season in the North Zone. Remove references to the take of antlerless deer by MLDP tag only on U.S. Forest Service, U.S. Army Corps of Engineers, and river authority lands, and clarify in regulation that take of antlerless deer is prohibited on U.S. Forest Service properties except during archery only season, muzzleloader season, special youth season, and during the 4 doe days on the LBJ National Grasslands in Montague and Wise counties.